One of five ‘Articled’ evangelical churches, so called because they were built under the article of the law issued in 1681 by Emperor Leopold I in an attempt to halt the spread of Protestantism. As such they had to be built at the edge of a village with the entrance facing away from it and to be constructed only from wood with no foundations, towers or bells. It was originally planned to build 38 wooden articled churches in Slovakia but only nine were built and of these five have survived. All of them were designed in the form of a ‘Greek cross’. The wooden church at Kežmarok is the only articled wooden church whose walls are covered in plaster. It was built in 1717 next to an older sacral stone building from 1593, although a reconstruction during the early 18th century left only part of the latter. Funds to construct the church were raised by means of a collection in which Protestants from countries of northern Europe participated. Swedish sailors are said to have participated in its construction, which is why the interior is reminiscent of the upside-down prow of a boat with round portholes. The ground plan of the church, built from yew and red spruce wood, has the shape of a Greek cross. The vault, with its illusive painting from 1718, is borne by four wooden spiral-curled columns. 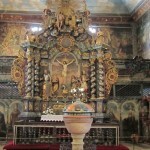 The wooden altar and pulpit with their rich Baroque figural and ornamental decoration are the work of Ján Lerch. The church organ with its wooden pipes are particularly noteworthy. The church at Kežmarok, along with seven other wooden churches of the Slovak part of Carpathian Mountain Area, has been included on UNESCO’s Word Heritage List.